Okra, Okra- What do I do with you? The other day my husband came home with a huge bag of fresh okra. I really love that people are willing to share their fresh produce with us. I already mentioned my problem with okra-mainly, that I don't really know what to do with it besides fry it and I am not a big fan of frying things at home. This time, I took my problem to Twitter. I got lots of great ideas and recipe links- oven roasted whole okra, grilled okra, stews, gumbos, etc. 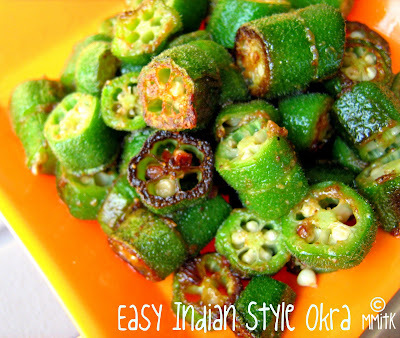 Kayte of Grandma's Kitchen Table sent me the link for Easy Indian style Okra on allrecipes- it looked easy, the spices sounded good and it was perfect for a quick side dish. I reduced the butter by a little bit and this easy okra dish was a real hit for us. 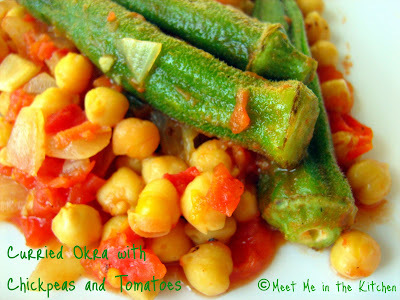 I also did some searching of my own and found this recipe on epicurious, Curried Okra with Chickpeas and Tomatoes. I love chickpeas and thought it would be fun to try a recipe that left the okra whole. My only comment on this one is to make sure that you don't cook the okra too long, because it tastes better when it still has a little firmness to it. I had to pick the tomatoes out of my husband's serving, but other that that, everyone liked this recipe too. I am glad that I have found more ways to cook okra-these were both really delicious! Here is the delicious ice cream that we used to make our ice cream sandwiches. Nancy shared the link for this recipe and since I had leftover lime curd, I decided this was going to be the way I used it up. This ice cream is custard based- egg yolks and milk- and when you take it off the heat, you stir in the lemon/lime curd. The custard then chills overnight and the next day you whip cream to soft peaks, and stir it into the custard. Then, it is ready to churn! The recipe has all the measurements in grams and ml- instead of being particular and using a kitchen scale- I just kinda estimated the amounts needed (not a great thing to do necessarily, but in this case it worked out fine for me). I didn't even bother measuring my lime curd- I just used all that I had left, which was more than the estimated amount the recipe called for. I also did not strain out my lime zest. The flavor was fantastic and the texture was perfect. This was really great ice cream. The other day on Twitter, I caught wind of someone's plan to make Lemon Curd Ice Cream. I think the idea started with Nancy-who had found the recipe (check out her blog for some great ice cream recipes this week), and other bloggers were planning on joining in- Kayte, and possibly some others. I am not quite sure who all ended up making the ice cream. 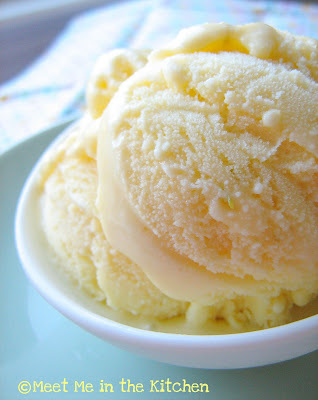 I had a little bit of lime curd left from the Tiramisu Cake, so I checked out the recipe and saw that I had a little bit more than enough to make the Lemon Curd Ice Cream, but in my case Lime Curd Ice Cream- I will post more about that tomorrow. As soon as I made the ice cream, which I must add is super delicious, smooth and has just about the perfect consistency, I decided that it was begging to be smooshed between some sort of cookie. I sent out a tweet asking people what cookie would be best. 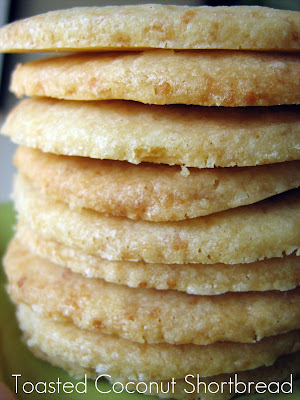 Lori aka Recipe Girl suggested some sort of shortbread and also put up a link for these Coconut Sugar Cookies. Tracey found this link for Toasted Coconut Shortbread and Jessica ended up making those too, for her beautiful TWD creation this week. At first I thought I would be really ambitious and make 4 cookies-but the next day I realized that was too much and I decided on 1 shortbread and 1 chewy. 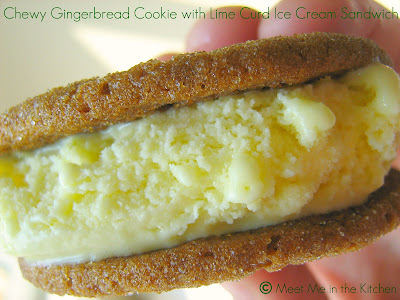 I really thought the gingerbread cookie would taste great with the lime because of my tasty experience with this lime cream pie with a gingersnap crust. 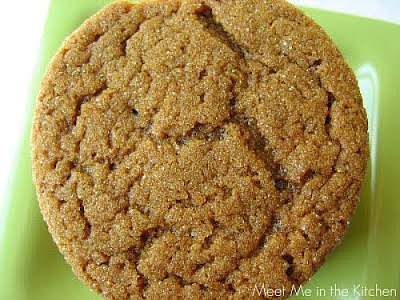 I left the chocolate out of those cookies and they were perfectly chewy and spicy. I accidentally left the cinnamon out of the dough, so they were very gingery. We loved them. My kids really loved them. The coconut shortbread was very delicious too. Just as a shortbread should be. Buttery, coconutty, and at the end, just a bit of a salty taste. Very delicious. Both tasted good with the ice cream. My husband thought the gingerbread cookie overshadowed the ice cream, but I disagreed. 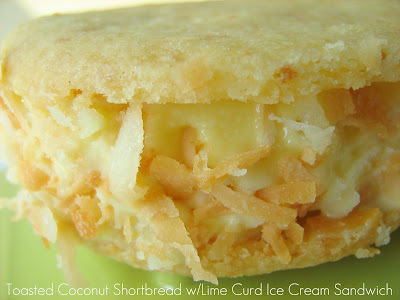 I rolled some of the coconut shortbread ice cream sandwiches in toasted coconut, just to use up what I had left. Yum. 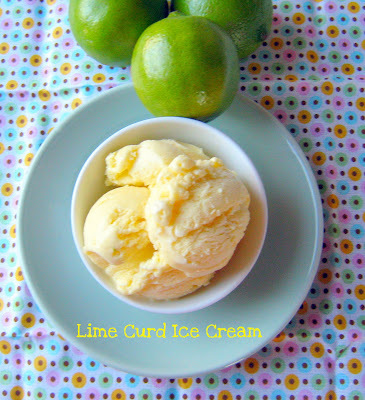 Come back tomorrow for the Lime Curd Ice Cream! 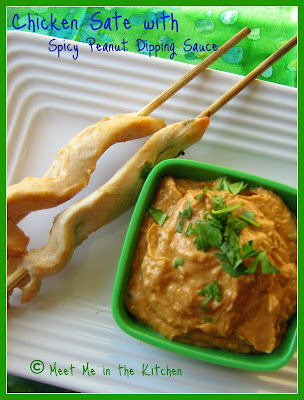 Today's CEiMB recipe- Chicken Sate with Spicy Peanut Dipping Sauce, is one that I have been wanting to try for awhile now. I am so glad that Cathy picked it! You can find the recipe on her blog- The Tortefeasor, which I highly suggest you start reading, if you don't already or you can find the recipe HERE. Now, I know my chicken is looking kinda sad, without any grill marks, but for some reason I decided to broil mine. Not really the best idea, since I put the broiler pan on the very top rack and even though I soaked my skewers, we still had some flames. Unbelievable!-especially since the day before my neighbor's kitchen was on fire. I stayed right there and watched them, but it was still a bit scary. I moved the rack down to the next notch, a little bit farther from the heat for the next batch and luckily we didn't have any more flames. My whole family liked the chicken. It was tender and flavorful, thanks to the marinade and the kids really enjoyed the whole eating-something-off-of-a-stick-that-you-can-then-turn-into-a-weapon-at -the-dinner-table idea. Overall though, we really enjoyed this recipe. Go see what the other CEiMBer's thought by checking out the Blogroll! I also revisited the Oven Baked Onion Rings that I picked a couple weeks ago. The recipe uses Baked Lays Originals for the coating and I thought it would be fun to try it with some of the other Baked Lays flavors. We tried Cheddar & Sour Cream, Sour Cream & Onion and Barbeque Flavor. The Sour Cream & Onion were the fave and the BBQ were the least fave, a little too sweet, but it was fun to try other flavors. 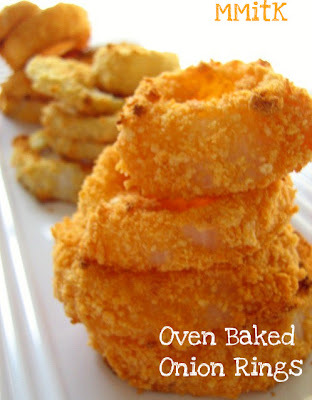 Pam tried the onion rings again recently too- check out her post-HERE! So, I found myself with a little leftover lime curd from the Tiramisu cake and millions of options of what I could do with it were going through my brain. Cakes, muffins, cookies, ice cream- really the possibilities seemed endless, and then I saw the very ripe peaches that needed to be used too. 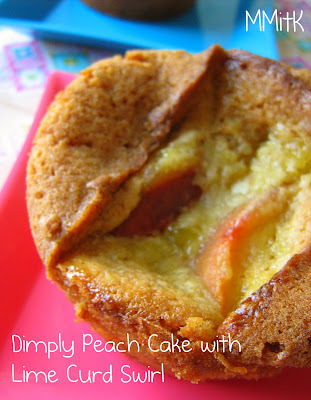 Dorie's Plum (but in this case, Peach) Dimply Cake is one of my favorite recipes. 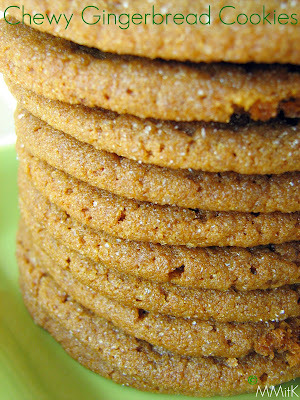 I made it the first time for myself for Mother's day-check the post out HERE and found the combination of cardamom, orange zest, brown sugar and fruit to be wonderful. It wasn't too long before someone chose it for TWD and unlike some things that I decide not to make again, I made this cake again and this time made 2 different variations- nectarine with orange zest and peach with lemon and basil- check out the post HERE. 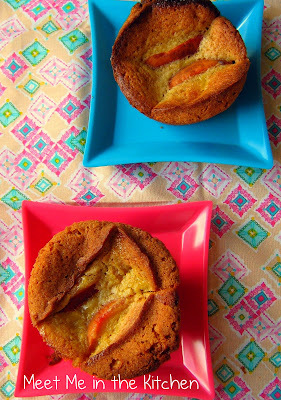 This time I decided to make the cake with peaches, lime zest, cardamom, and then, swirl lime curd into the batter. I used a jumbo muffin tin and got 6 cakes. 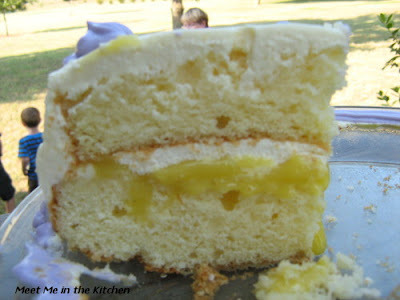 I swirled about a Tablespoon of lime curd into the top of each cake and then added 3 peach slices. I baked them for 25 minutes and they weren't done yet, so I kept adding 5 more minutes, until they were finally done. We ate these for breakfast on a Sunday and my husband loved them! He actually ate 2. There is just something about this cake. It is delicious! There was still a little bit of lime curd and I turned it into lime curd ice cream, but you will have to wait a couple days to see it- it was fabulous. Hope you don't mind the little hands- there is always someone trying to steal the food I am taking pictures of! Sometimes a recipe in Baking:from my home to yours looks so good, that I just can't wait for someone to choose it for Tuesday's with Dorie. 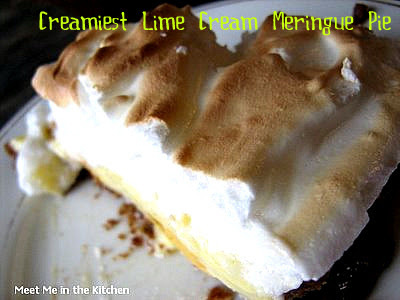 Such is the case with the Creamiest Lime Cream Meringue Pie, which I opted to make with the mango that Dorie suggests in the Playing Around section. I made this at Thanksgiving last year because I wanted something a little bit tropical to go along with the other desserts we had. You can find my post and my version of the recipe HERE. Instead of the normal pie crust called for, I made a gingersnap/macadamia nut/ crystallized ginger crust- the crust from this recipe. I also reduced the amount of butter in the filling by 2 sticks. Yes, you heard me right. I left out 2 sticks of butter in the filling. The lime cream filling in this pie is almost exactly the same as the lemon filling in The Most Extraordinary French Lemon Cream Tart that we made last year for TWD. I remember tasting the cream before I blended in the 2+ sticks of butter for that tart and thinking that it tasted better without all the butter, so this time I just left it out. I think I added 3 Tbls and that is it. I also doubled the meringue because I wanted it to be tall and tasty. Thanks to Linda of Tender Crumb for choosing this great-tasting pie. 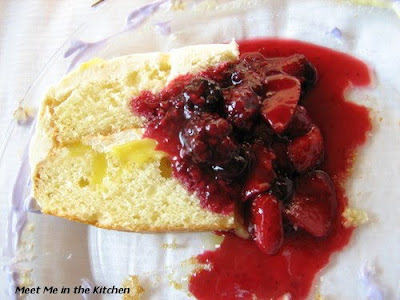 You can find the recipe on Linda's blog also, as well as some beautiful pictures. 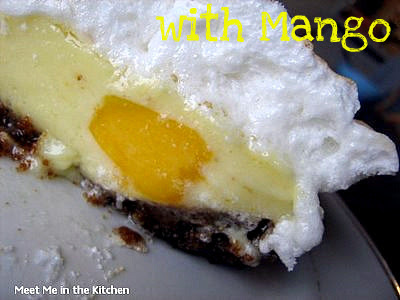 Make sure you check out the rest of the TWD Blogroll to find a million great variations of this pie! I have this thing for watermelon. I really love it. I think that if I had to, I could probably survive off watermelon alone. I also really like fruit salsas. Especially when they are paired with fish or other kinds of seafood. I was thumbing through one of my cookbooks and found this recipe. I thought it sounded really good and I knew that my kids would love the fish, so I decided to try it. The salsa was spicy! I don't know if I just got a really hot jalapeno or it was the combination of the jalapeno and the red onion, which was a hot one, but it had a real spicy kick- which I loved. 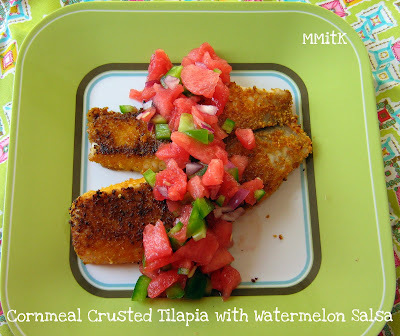 It was a little too much for my kids- they all tried it, but couldn't handle the heat, so they ended up eating the fish on its own, with some plain watermelon and sliced green peppers. I can't even tell you what a wonderful combination this was. 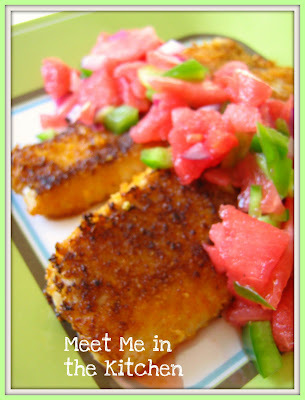 The tilapia was flavored just right and the watermelon salsa was the perfect combination of sweet and spicy. Putting the 2 together was amazing. One of the best dinners I have had in awhile. I was sorta glad that the salsa was too spicy for my kids, because that left more for me! I tore this recipe out of Everyday with Rachel Ray Magazine about a year ago. I think. I mostly forgot about it until I was thumbing through someone else's copy of the same issue and I saw it again. I am doing some preschool activities with my 4 and 2 year old daughters who are home with me during the day. Nothing too intense, but we officially call it "school", so that there can be rules and specific time set aside to do the lessons and things that I want to do. Amazingly enough, my 4 year old is doing really well with this set-up and follows the rules. I am doing it mostly for her, so she will be ready for the big K, next year. Anyway, my 4 year old is the child who is the most interested in helping me in the kitchen. I thought this soup would be a fun school snack. We made it together, which was rather messy, especially when the girls took over the job of making melon balls and plopping them into the food processor, but you can't really have fun without a mess, right? There was lots of splattered watermelon juice, but lots of smiles too. 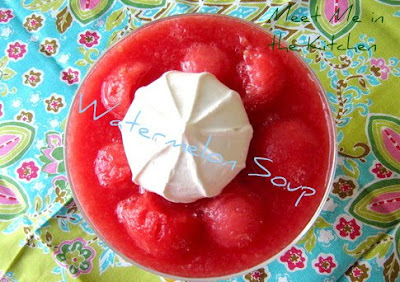 I reduced the amount of sugar that is added to this soup because our watermelon was soo sweet and delicious. I also only made 1/4 of the recipe because this was our special time and our special treat. It was quite a fun and delicious day. I finally got around to making this dip that I saw in a million different places! I remember seeing it on Aggie's Kitchen a while ago and I don't even remember the other blogs where I saw it. We had some friends coming over for dinner and I thought this would be a great appetizer/side for everyone to munch on. 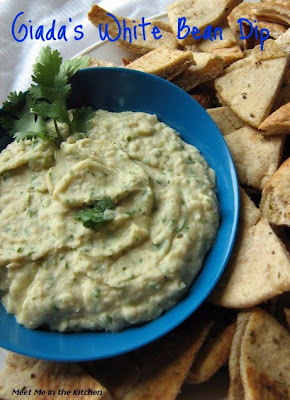 This dip is similar to hummus, but with white beans. I added an extra garlic clove (on accident), but no one seemed to mind too much. Everyone really enjoyed the dip and pita chips. I didn't use as much olive oil as Giada called for, on the pita chips and they still turned out nice and crisp. I had a little of the dip leftover and I used it as a spread for some sandwiches later in the week. I am definitely going to be making it again, in the near future as football season is upon us! 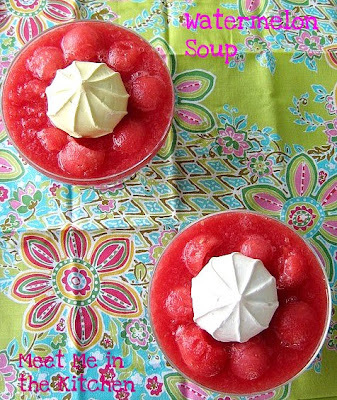 This is a recipe from a cute cookbook called- Cooking Together from Williams Sonoma by Erin and Tatum Quon. I love any recipe that makes meals more fun and exciting and also really like getting my kids to help me in the kitchen. 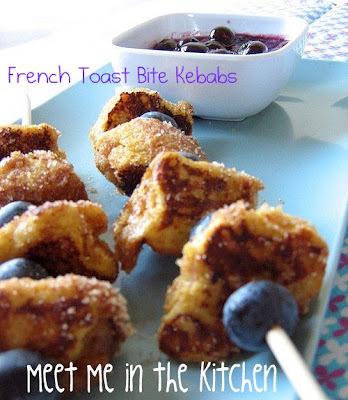 This is a pretty basic french toast recipe, except for the fact that you cut your bread into cubes and can turn it into kebabs. Also there is a homemade blueberry sauce/syrup that goes along with this. I followed the recipe pretty closely except that I use a whole wheat baguette for my bread. Next time I will definitely toast my bread cubes, as they didn't stay as firm as I would have liked. I also did not cook the bites in butter. I just sprayed my skillet with cooking spray and had no problems getting them to brown up. 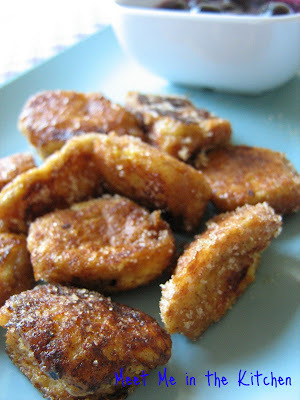 After you cook them, you toss the warm french toast cubes in cinnamon-sugar, which adds a little bit of sweetness and really takes away the need for any syrup, in my opinion. My kids loved this breakfast. It was really a fun one to make and eat together. Combine the blueberries and maple syrup in a small saucepan over medium-low heat. Bring to a boil, stirring continuously. Set aside. Whisk together the eggs, buttermilk, milk, vanilla, and salt. Add the bread cubes and toss so that all sides are coated and egg mixture is soaked up. Over medium heat, melt 1 Tbls butter and add half of coated bread cubes. Cook, until golden, turning on all sides. Repeat with remaining bread cubes. 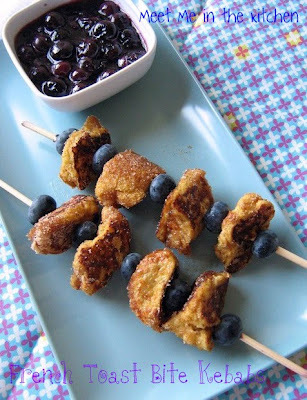 These can also be put on skewers with fruit and dipped in the sauce. I have been playing around with my photos a little bit. It's pretty fun. 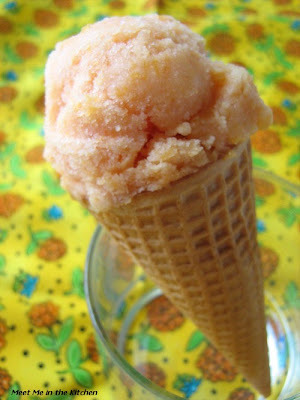 I don't really remember how it came up, but some of us were talking about making ice cream and Nancy mentioned how delicious David Lebovitz's Peach Frozen Yogurt was and since I had peaches, I made it. 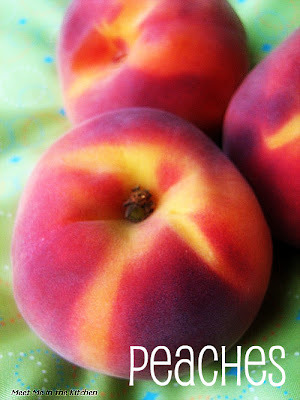 I didn't weigh my peaches (mistake)- I just assumed that my peach mixture was the perfect amount, but when I churned it, I realized I should have just measured the darn things. My frozen yogurt yielded way more than 3 cups and it was really peachy, which was fine with me, but I don't think it turned out exactly how the recipe wanted it to. We still enjoyed it. My youngest came in and saw me taking pictures and snatched the cone from me- so I let her hold it for the pic. My mother-in-law had a birthday at the end of July and I decided I would make her a little cake. She had a really busy day, so I just made it, took it over and put it in her fridge, and she was surprised later, when she came home. 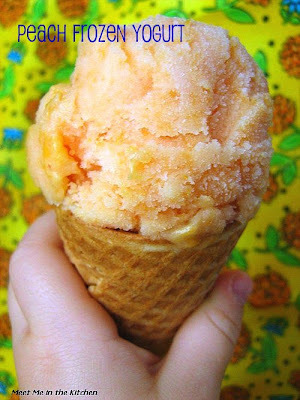 I saw the recipe for Georgia Peach Buttercream in the June issue of Southern Living and it sounded like a perfect, summery frosting. Plus, I live in Georgia, so I pretty much had to make it. 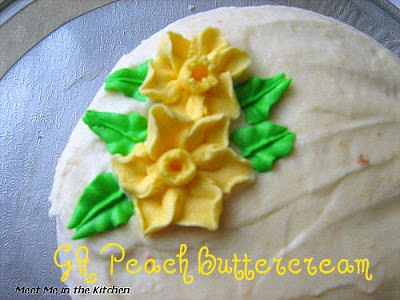 The frosting is a basic buttercream with peach puree added to it, to give it a light peachy flavor. I read a couple of the reviews and one of them said that the peach flavor was really light, so I added more peach puree than it called for. 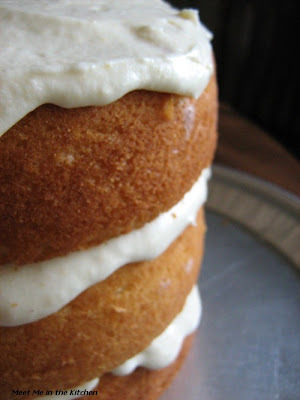 It did add a little extra flavor, but made the frosting extra hard to keep on the cake. I think this frosting would work great on cupcakes or a 9x13-inch cake. Maybe it was just really hot- once I put the cake in the fridge it was all good. 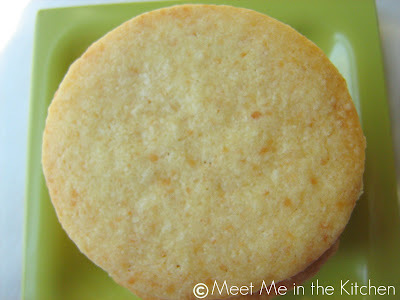 I used this cupcake recipe, which uses a white cake mix, but adds buttermilk, butter, and almond extract, which all give it a great texture and flavor. I made three 6-inch cakes and my mother-in-law called me later raving about the cake. She said it was her new favorite. Yay! for birthday success! The other day my oldest child asked, " When can we choose what we have for dinner?" I replied, "how about right now?" I pulled some kid cookbooks off the shelf and told my 7-yr old son and my 4-yr old daughter that they could each plan a night's dinner. They could choose a main dish and a side. My daughter wasted no time at all. She chose these 2 recipes from the first cookbook that she picked up, C is for Cooking:Recipes from the Street. My son, on the other hand, had to look at every single kid cookbook, before he decided on chicken burgers, green beans and olives. 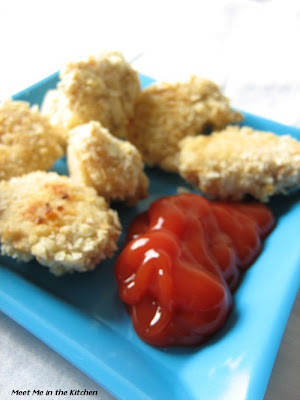 My kids enjoyed these homemade chicken nuggets and it was really fun letting them help in the kitchen. The C is for Cooking Cookbook has certain steps that it deems appropriate for kids, so they can help put the meals together. Two of my kids love any kind of salad dressing. They like dipping their veggies and lettuce or enjoy salad dressing when it is poured over the salad on their plates and this apple-y vinaigrette was no exception. My son doesn't do salad dressing, but will still eat the veggies. Everyone was excited about this dinner and I have to admit that the chicken tasted better than I thought it was going to. The honey mustard gave it just the right amount of flavor. The kids are already begging for another chance to pick dinner. 1. Preheat the oven to 400 degrees F. Lightly grease a large rimmed baking sheet. 2. KIDS- Place the crackers in a large plastic bag and zip the bag. Now gently pound your fists to crush the crackers into thin crumbs. Pour the crumbs onto a large plate. Set the plate aside. 3. Cut the chicken breasts into 1 1/2 squares. Sprinkle evenly with salt. 4. 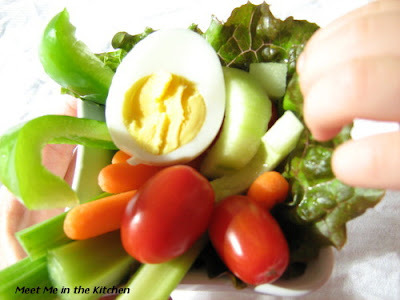 KIDS- In a large bowl, stir together the mayo, egg white, and honey mustard until well-mixed. Add the chicken to the mayo mixture and gently toss to coat the chicken pieces. 5. KIDS- Gently press each piece of chicken into the cracker crumbs until the nugget is covered all over. Transfer the nuggets to the prepared sheet. 6. 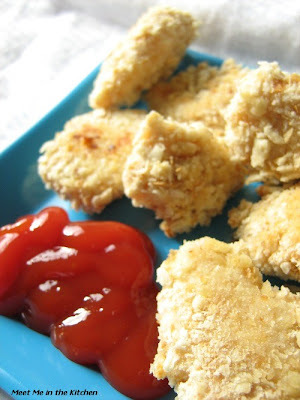 Bake the nuggets, until chicken is cooked through, about 15 minutes. 1. 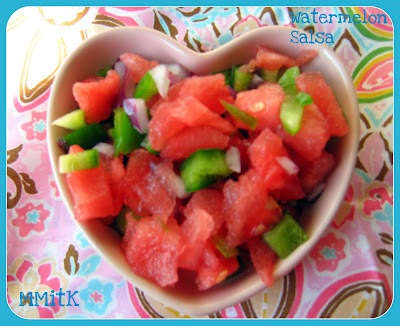 In a small bowl, make the salad dressing: Whisk together the apple juice, vinegar, salt, and pepper. Whisk in the oil until blended. 2. Arrange separate bowls of salad ingredients on the table. Give everyone a salad plate and let each person make his or her own salad. Try to "use" as many colors as possible! Use whole lettuce leaves as salad "bowls" or "boats". Drizzle a little salad dressing over you salad. Back in May, Megan chose Tiramisu Cake for Tuesday's with Dorie and I didn't make it for some reason or another, one of the reasons being that I don't drink coffee and didn't spend the time trying to figure out some kind of flavor substitute. Then, a few weeks later, the June issue of Bon Appetit arrived in the mail and it had a recipe for Mixed-Berry Tiramisu with Lime Curd. 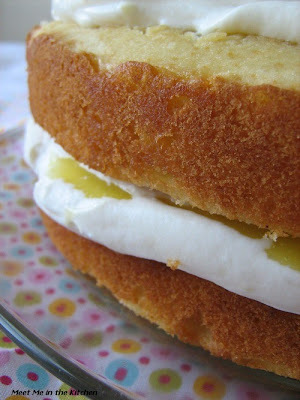 As soon as I looked at the recipe, I knew I would be making Dorie's cake and the berries/lime curd from Bon Appetit and somehow combining these 2 recipes for an awesome cake. I just didn't know when. Fast forward a couple of months. My mother-in-law asked me to make a cake for her mother/my hubby's grandma's 89th birthday. Without thinking twice- I knew this was the cake. I made the cake and filling/frosting from Dorie's recipe (subbing 1/3 less fat cream cheese for the mascarpone because someone mentioned that it worked great when they did that for TWD) and the mixed berries, lime curd, and lime syrup from the Bon Appetit recipe. The lime curd and berries are made the night before and then they sit in the fridge to chill. The cake baked up perfectly. 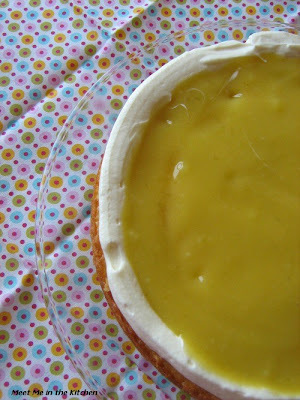 I soaked it with the lime syrup, then filled the middle with the lime curd, and frosted it. Everyone loved it. There were even a few requests that it be made again in the future. It would be great as a trifle too. I am so glad my recipe mixing turned out so deliciously! Working with a stand mixer, preferably fitted with a paddle attachment, or with a hand mixer in a large bowl, beat the butter on medium speed until soft and creamy. Add the sugar and beat for another 3 minutes. Add the eggs one by one, and then the yolk, beating for 1 minute after each addition. Beat in the vanilla; don’t be concerned if the mixture looks curdled. Reduce the mixer speed to low and add the dry ingredients alternately with the buttermilk, adding the dry ingredients in three additions and the buttermilk in two (begin and end with the dry ingredients); scrape down the sides of the bowl as needed and mix only until the ingredients disappear into the batter. 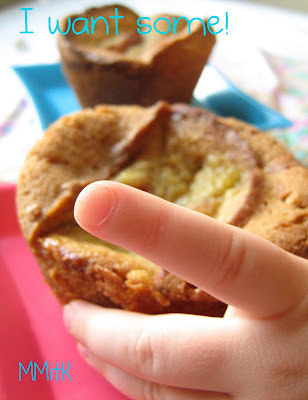 Divide the batter evenly between the two pans and smooth the tops with a rubber spatula.Bake for 28-30 minutes(I baked my cakes for 27 minutes and they were perfect! ), rotating the pans at the midway point. When fully baked, the cakes will be golden and springy to the touch and a thin knife inserted into the centers will come out clean. Transfer the cakes to a rack and cool then for about 5 minutes, then run a knife around the sides of the cakes, unmold them and peel off the paper liners. Invert and cool to room temperature right side up.